After class was over, I attended the AU Veterans Lunch where Lynn Allen led a survey of questions with live audience interaction striving to make AU better next year. Some of the items discussed were the dissatisfaction with all meals being held in the Exhibit Hall, class length and quality, and many more. 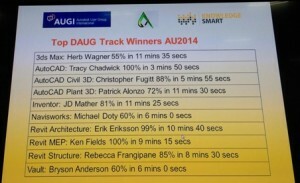 Top DAUG winners were announced! I attended Jerry Milana and Fred (Tiny) Babin class on Networking Autodesk Product A to Z – network licensing. They only gave them an hour for what could have been two hours of great content. So much to take in and so little time. This class needs to be expanded/extended/doubled. The Closing Keynote was a combination of supersonic cars, 3D printing in space and zero gravity fitness equipment. 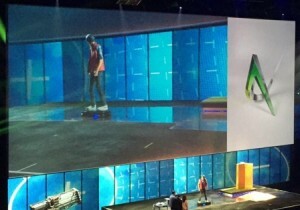 While some may have thought it was a snoozer… they then brought out the Hover Board – yes are real working hover skateboard like in Back to the Future. It really worked and the technology might be used in future based isolated building in earthquake areas. After the close – it was off to the Party at the Palms. What an extravaganza. As I look back on this event, I take away new connections, new perspectives and increased expectations for the future. Tap into learning where you can get it. Read as much as you can. Strive for improvement every day. Until next year… adios Vegas.